GRENADA'S SAGA OF THE "HORSELESS CARRIAGE"
Some older heads refused to believe such a thing existed. The swanky yacht, Lysistrata, at anchor in St George's inner harbour, was the centre of bubbling excitement. She had slipped into the bay just after dawn and, at first, nobody noticed her. But the word had gone around and now she was the focus of the rapt attention of a gaping crowd gathering on the Carenage. Yachts were not common sights in Grenada then, and, undoubtedly, "Lysistrata" had lovely lines. Although they were wide-eyed with wonder, however, the crowd was not interested in the boat. Their attention was riveted on an object securely strapped to the deck of the yacht. It was an object no Grenadian had ever seen before. For years, though, they had heard a lot about it. Many tall tales had been told and it was difficult to believe some incredible things said about it. In fact, some older heads refused to believe such a thing existed. It wasn't possible, they said. Now, they had to eat their words for there before them was the reality. There was Lysistrata and there on her deck was a "horseless carriage". Yes, there for all to see was a motorcar. The year was 1906, the date was March 13th, and, for the first time, mechanised transportation had come to the Isle of Spice. 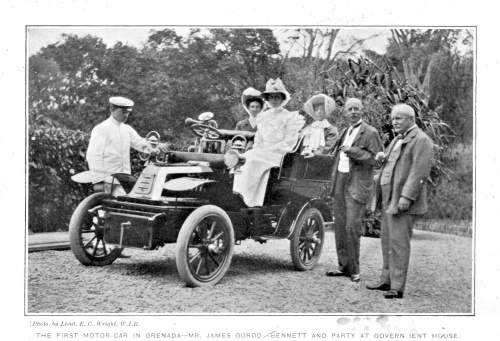 Photo from the 1907 Grenada Handbook: "The First Motor Car in Grenada---Mr. James Gordon Bennett and party at Government House." photo by Lieutenant E. C. Wright, W.I.R. Adding to the excitement was the fact that Grenadians knew a lot about the man who owned Lysistrata and the car he was taking with him on his Caribbean cruise. He was no ordinary visitor. He was James Gordon Bennett Jr. and, everywhere, his name was a household word. Bennett was rich and well-known as publisher of the New York Herald which he had developed into one of the earliest United States newspapers providing its readers with complete feature coverage. And when Dr David Livingstone, the distinguished British explorer and missionary, disappeared into Central Africa without a trace, Bennett gave a young journalist, Henry Morton Stanley, the job of searching for him. It took Stanley several months but, on November 10th 1871, he found Livingstone in a little village on Lake Tanganyika. There, with hand outstretched to the explorer, Stanley spoke his now famous greeting, "Dr Livingstone, I presume". When Bennett visited Grenada, there were not yet any radios in the island and TV was still a dream to be developed. News traveled slowly. However, Grenada was linked to the outside world by a submarine cable and, through this link, details of the Herald scoop of the Livingstone story had come through. Grenadians had heard about James Gordon Bennett Jr and his achievements, and that added to their excitement when this famous man arrived in Grenada. The magic moment came when the car having been landed on the wharf roadway, Bennett's uniformed chauffeur/mechanic swung the crank-handle at the front of the vehicle and the engine roared into life . This was an automobile worthy of the prestige of the Bennett family. At the turn of the century, "horseless carriages" were being manufactured by dozens of United States companies, and Bennett could have purchased an "economy" car from one Henry Ford whose manufacturing company had been launched in 1903. Or, he could have chosen a more expensive vehicle from a wide range of automobiles including products of James Ward Packard and Ransom Eli Olds who made the Oldsmobile. But Bennett looked to Europe for his motorcar. There, the French were producing the Peugiot, Renault and De Dion Bouton, and it was the last mentioned which caught his fancy. This then was the motorcar which, eighty-eight years ago, chugged through St Georges, the first automobile ever to be seen on the island. It bumped noisily over the unpaved roads of the town while amazed Grenadians gawked wide-eyed from every window, and droves of panting schoolboys raced behind this fantastic creation of the modern age. Bennett made two excursions into the countryside. One was a trip of ten miles to St David's and the other was to the town of Grenville twenty miles away. And, both round-trips were accomplished at a speed which astonished spectators. The car ate up the distance at an average rate of 15 miles per hour, a speed much faster than any horse and carriage had ever been able to attain. When the Lysistrata sailed a few days after, the De Dion Bouton went with her, but, a year or two later, the first car to be owned by a Grenadian arrived. It was a steam-powered American make manufactured by the twin brothers, Freelan and Francis Stanley. Known as the "Stanley Steamer", one of these cars, stripped down as a racing car, had captured, in 1906, the world speed record of 127.66 miles per hour. Another importation about this time was the first truck to be put in service in Grenada. It was an American made Jeffrey with four wheel brakes and four wheel steering, but its usefulness was short-lived. This heavy vehicle had solid tires which did terrible damage to the already rough roads, and the Government was forced to ban it. An interesting feature of motoring then was the fact that, because of the fear of fire, storage of gasoline was strictly controlled and a licence was required before it could be purchased. "Volatile petroleum", as it was called, had to be stored in a designated "Petroleum Warehouse", and individuals were not allowed to have more than 60 gallons in their possession, including what was in the vehicle's tank. Old timers say that, in practice, most of the island's gasoline stock was stored under lock and key in a hut at sea level under the cliff on the eastern side of the entrance to St George's harbour. When a motorist needed to fill his tank, they say, he boarded a small rowboat, and accompanied by a Customs Officer carrying a red flag, crossed the harbour to the gasoline hut, filled his container and returned to gas up his vehicle. Before World War I, just a few vehicles were imported into the island. One was a De Dion Bouton, a later model to the one owned by Bennett, and another was a Jeffrey car. A third was an American made Overland car. This vehicle was made by the Willis-Overland Company of Toledo, Ohio and was in service up to the 1930s. The Overland did not come directly from the United States. A Grenadian, working on the excavation of the Panama canal, bought the car second-hand in Panama and returned to Grenada with it in 1914 when the canal project was completed. Although it was only the eighth automobile to run on the island's still unpaved roads, this vehicle was assigned the number P18. The reason was that the Grenada Government, still without a car of its own, had reserved the numbers one to ten for itself. The "P" before the number indicated this car was for "private" and not "hired" use. Nevertheless, although it was used by its owner as a private car, P18 was also the the first vehicle to operate in Grenada as a taxi and could be rented on a self-drive basis. These were the pioneer days before cars were equipped with batteries and P18 had carbide gas headlights and a taillight which burned kerosene. It was also before automobile doors had glass windows which could be rolled up. Instead, like all other vehicles of that era, P18 had "side-curtains". These were cumbersome celluloid panels on frames which, when a shower of rain came, had to be hurriedly fitted into slots at the tops of the doors. The tops of the "curtains" were attached by snap fasteners to the cloth roof of the car, and this kept out most of the rain. Shortly after P18 arrived, Government spent four hundred and forty-seven pounds, ten shillings sterling for two Ford station wagons and instituted a passenger and mail service to the country districts. Subsequently, two Jeffrey 7-seaters were bought for this service and a maintenance garage was opened on the ground floor of what is now the National Insurance Scheme Building on Melville Street. That garage also took in private work and you could have a complete motor and transmission overhaul for only three pounds three shillings sterling. And, if your crank case had a leak, it could be repaired for ten shillings which, in those days, was equivalent to about US$2.40. A leaky carburetor ? No problem. That could be fixed for four shillings and, if the rain was driving in through one of your doors, the charge to remedy that was two shillings and six pence. The front wheels of today's automobiles are independently suspended, but in the old days, cars had front axles. That construction gave a rather uncomfortable ride and roads were so bad axles often got bent. The garage would repair this damage for sixteen shillings. As useful as the Government garage may have been, it could not take care of what was then, perhaps, the greatest motoring hazard. Punctured tyres. Tubeless tyres were unheard of then and inner tubes were not as strong as those of today. Running on rough macadamized roads, those inner tubes were subjected to extreme torture and no motorist dared to set out on a journey without his patching kit. Sometimes, however, because of the frequency of the punctures, patches and patching fluid ran out. That's when ingenuity was required, the old timers say. "Many a time", one aged motorist told me, "the only way I could get the darned car back home was to stuff the flat tyre with dried banana leaves and anything else I could find." Another problem with punctures in those early days was that, unlike the modern motor car, there was no easy way of taking off the wheel. It didn't come off with the slackening of four or five nuts. When a puncture was to be fixed, it was the rim of the wheel which had to come off. That rim was bolted to the wheel by a series of U-shaped brackets, and they never ever came off or went on without a fight. Originally, the preference of the Grenadian motorist was for American cars and, through the years, there were importations of such makes as Chryslers, Pointiacs, Chevrolets, De Sotos, Erskines and, of course, Fords. There was even a Pierce Arrow sports car brought in by a former member of the Royal Grenada Police Force who had migrated to the United States. This man made a pile of money as an operator in the illegal "numbers" game, and circumstances of his return to Grenada are shrouded in mystery. It is said his problems began in New York when other operators, jealous of his success, threatened his life. The story goes that, when things got too hot for him, he bought a second-hand iron safe and shipped it to Grenada. Then he quietly drove the Pierce Arrow over the border to Canada and, with the car, took a boat home. The shock came when he went to clear the iron safe from the Customs in Grenada. The Authorities found it was stuffed full with United States hundred dollar bills ! In 1914, the Grenada Government passed legislation which was to switch the preference gradually to British cars. Up to that year, all vehicles paid an import duty of 10%. That was changed. The legislation maintained the 10% rate of duty on vehicles of "foreign" manufacture while vehicles manufactured in the British Empire paid only 8%. Later on, the preference was increased when foreign cars paid 22.5% against the Empire rate of 15%. The gap was made even wider when the Empire rate was maintained at 15% and the foreign rate was jacked up to 35%. It is estimated that by 1930, there were some 400 vehicles on the island, and it is remembered that up to the start of World War II in 1939, the highest number carried by a vehicle was P586. That car was a Studebaker Champion imported by Charles H Whitaker, the then resident United States Vice-Consul. After the war, importation of vehicles speeded up and, when there was no longer a preferential rate for British vehicles, the Japanese began to penetrate the market. By 1977, the earliest year for which there are official statistics, there were 6,880 vehicles registered. That figure includes 840 motor cycles, 3,825 private cars, 498 taxis, 535 trucks and 445 buses. In 1990, fire destroyed statistics for that year. Re-registration in 1991 showed the number of motor cycles had dropped to 378, there were 4,464 private cars, 275 taxis, 576 trucks while busses had gone up to 557. As vehicles grow old and are taken off the road, the old numbers are assigned to new cars, and in 1991, a milestone was passed. In that year with all back numbers filled up, 9999 vehicles had been registered. It was then, on May 31st 1991, that the first number of a new series was issued. That series started from A1, ran to A999 and was completed in August 1992. On August 8th 1992, the first number of series B1 to B999 was issued and that series was completed in December 1993. The current series, C1 to C999, started on December 30th 1993 and is expected to be completed before the end of this year. Motoring in Grenada has come a long way since the memorable day when James Gordon Bennett Jr drove his De Dion Bouton through the countryside. That relic of Grenadian history has disappeared but an important relic still remains. It is the island's first taxi, the Overland, P18. 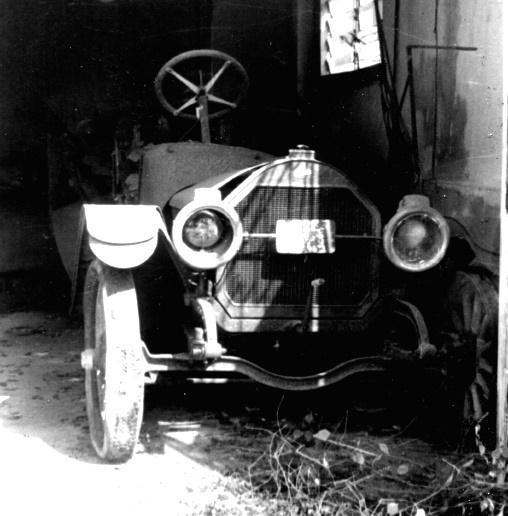 1914 Overland--the first taxi in Grenada--as stored in Alister Hughes garage. For information on how to contribute to the restoration of the Overland, click here. The body of this car, with its wooden frame, needs a great deal of rebuilding. That can and will be done, and except for the need of a new magneto, there's nothing wrong with the engine which cannot be fixed. So, who knows ? Perhaps on your next visit you'll see this vintage car ambling sedately around. It probably will have a new number but you'll recognise old P18 by its tall, narrow wheels with wooden spokes. Look, too, for the crank handle in front, for the big carbide gas headlights and, if it's raining, for its side-curtains. And, don't be surprised if this rugged old faithful is still sprightly enough to be put out on hire. Taxi, anyone ?